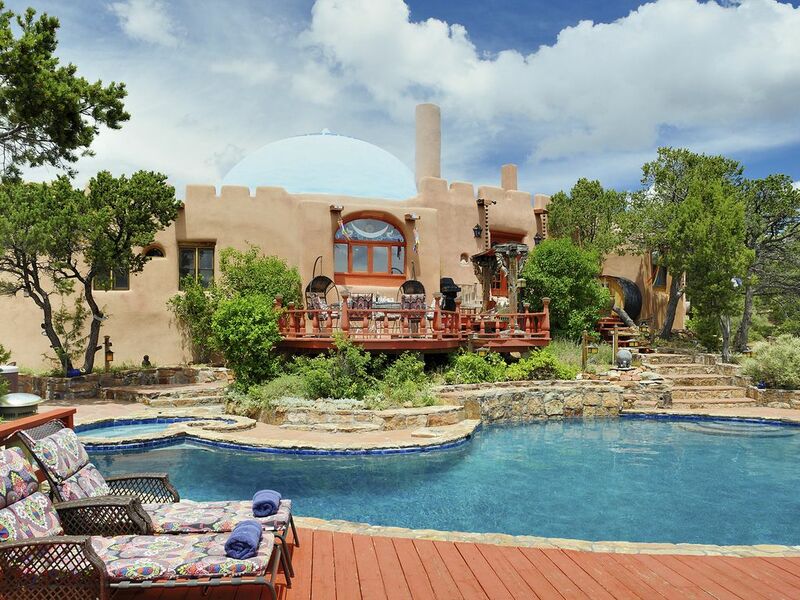 Rass Mandal is the most unique adobe vacation residence in Santa Fe. It is situated on a mountain range of pine forests with spectacular views. Entering brings you to another time and presents a serene and inspiring atmosphere for all. The house and grounds of more than 20 acres offer abundant locations for quiet time. There are numerous hiking & mountain bike trails immediately accessible, some of which take you directly to the center of Santa Fe. Ski Santa Fe is 30 minutes from the center of Santa Fe, just add ten minutes to that to get there from Rass Mandal. Rass Mandal was featured on HGTV's House Hunter's on Vacation with the initial airing on June 22nd 2012. Upon entering the home you encounter a large domed circular living room (Mandala Room) complete with a fireplace, eastern antique furniture and beautiful views looking out to a pool. This space is ideal for group sessions, gatherings and entertainment. Off to the left of the living room is the dining room and kitchen area. The dining table has room to accommodate 12 and is a great area for entertaining and formal meals. The kitchen is open plan and has a Moroccan style fireplace and a very comfortable breakfast nook ideal for bird watching. Behind the kitchen is a queen size bedroom and a bathroom, secluded from the rest of the house with its own private entrance. To the right of the living room are guest quarters, each room offers views overlooking the grounds and the entire Santa Fe valley. The master bedroom is complete with a large meditation/work area, beautiful bathroom and sunken Jacuzzi with views. Additionally, there is a 2nd story observation deck that provides expansive views over all of Santa Fe, the Jemez Mountains and beyond. Although the house is not air conditioned, there are ceiling fans in every bedroom. However, given the cool evenings AC it is not actually necessary. Heading outside, there is a large private pool, jacuzzi style 5 person hot tub, plunge pool and sauna. The pool is normally heated from May 1st to October 1st. We do occasionally, with weather permitting, extend the heating of the pool for a week or so to either side of the date range mentioned. However, the pool is approximately 40,000 gallons and heating is not feasible during the other times of the year. Generally the pool water temperature will be maintained at approximately 74 - 80 F throughout the heated season. We have invested in renewable Solar Technology for heating the home and the pool thus keeping our environmental footprint to a minimum. The hot tub is kept at 104 F all year-round. All this is surrounded by a deck and patio ideal for outdoor dining and relaxation. There is also a gas-fired Fire Pit for enjoyment during the cool evenings. Burn restrictions imposed by Santa Fe County may sometimes restrict its use. Additionally, there is a small cabin on the property about 150 feet from the main home that is included in the rental for guests #11 and #12. The cabin has a queen bed and a bathroom (with a shower) plus a TV. The maximum occupancy for the total residence still remains at 12 people and the cabin rental is required for parties of more than 10 people. I must reiterate that Rass Mandal accommodates a maximum of 12 people given the above bedroom configuration and we do not permit any more than that number without prior agreement from me (Richard). This limit also applies to 'guests' even visiting for just the day and not residing at Rass Mandal. Should you be planning on inviting a few guests to visit, please discuss it with me before you book Rass Mandal. We are honored to receive requests to host weddings and other very special events at Rass Mandal but unfortunately we are only able to accommodate micro weddings or events of less than 20 people in total. However, we do have a recommendation for a wedding or event venue that is only a 5.5 mile drive from the residence. It is called ‘Neptune Studio Event Space‘ and you may visit our Rass Mandal website to learn more about it. This venue is an historic site and located on Canyon Road in the heart of the Santa Fe art district. Perhaps use this space in tandem with residing at Rass Mandal. Rass Mandal provides a truly unique experience in Santa Fe. It's incredible architecture, shapes, and spaces transport one to ancient India yet with all the modern conveniences in an amazingly beautiful location high in the foothills of the Sangre de Cristo mountains above the city with spectacular views. While only minutes to the historic Plaza, all the downtown cultural amenities and many fine restaurants, Rass Mandal is a quiet and peaceful retreat not to be missed. I encourage you to read the reviews from our previous guests. Cancellation Policy: Should you cancel 60 days or more before commencement of the rental, your deposit will be returned in full. Should you cancel 59 days or less prior to commencement of the rental, you lose your deposit. We will endeavor to rent the property for your cancelled dates and should we be successful we will return a further portion of your deposit as applicable. Should you believe you may need to cancel, you should consider taking cancellation insurance available from VRBO/HomeAway. Hi, my name is Richard Woodruff and I am an American born in Jersey City, NJ and now living in Santa Fe after having spent the last 28 years living in Europe. You can find me on LinkedIn and on Facebook. I own Rass Mandal and I am a 50% owner of Adobe Casitas Vacation Rentals, Inc. - a property management and short term vacation rental company. I am also a real estate broker in Santa Fe and work exclusively with buyers seeking a residence in Santa Fe. Rass Mandal has unique architecture and is on 10 acres with fabulous unending vistas. It is in the mountains for easy access to hiking and mountain biking yet only about 10 minutes from the center of Santa Fe. The feeling in these hills is truly refreshing and energizing! Staying at Rass Mandal provides a unique atmosphere that is not found at most vacation rentals. The house and grounds offer abundant space for renewal & reflection as well as exercise & sharing. We have also invested in renewable Solar Technology for heating the home and the pool; keeping our environmental footprint to a minimum. toilet, shower, The cabin has a queen bed, TV & a bathroom with a shower! toilet, combination tub/shower, jetted tub, Jetted tub accommodates two people! All bathrooms are furnished with towels, custom organic soaps, hair shampoos & conditioners. Additionally, blow dryers are provided. The property is at 7850 feet with hiking access to Atalaya mountain (9200 feet). Although only 10 minutes to the center of town - the residence is located in the Sangre de Christo mountain range. Rass Mandal is on 10 private acres with hiking trails right from the front door. You can climb Atalaya (9200 feet) or walk to town through the Arroyo. Views over entire Santa Fe 50 plus mile views of Mountain Ranges View sunsets and sunrises! Radiant heating! Ceiling fans and screened windows for warm nights in all of the Bedrooms. Professionally cleaned linens are provided for all sleeping accommodation. All towels provided for guests - including hand towels, bath towels and pool side towels. Outdoor Yoga Pavilion with yoga mats provided - screened but not heated therefore only suitable with weather permitting. (1200 square feet). 25 foot circular living room with seating for 12 easily accommodated. Full wood burning fireplace, skylights and views to the pool. Ice maker, Filtered water, etc. Viking Professional 36" gas range - fully adequate for a large turkey. Sugar, salt, spices and other condiments are provided. Everything you need is provided for a fully set table of 12 people (plus extras). Table is 9' long and seats 12 comfortably. (4) DirecTV Satellite Network, Netflix streaming, Amazon streaming. Streaming capability to sound system in Mandala (living) Room. Blue Ray Playstation 3 Player for both DVD and Blue Ray disks. Also the receiver for Netflix and Amazon streaming in dining room. There is a medium size library of books. There are a few board games including Monopoly, Chutes & Ladders, Scrabble, Chess and Parcheesi among others. Music streaming is available through the Rass Mandal WiFi network. Bring your iPhone and stream from your own music or music on Pandora. Netflix and Amazon subscriptions provided. There is a gas-fired Fire Pit on the property for enjoying the cool evenings! Santa Fe County burn restrictions may occasionally restrict its use. Deck and Patio around pool and accommodating outdoor dining and sunbathing. Although the home is basically on one level, there are internal stairs (3) at various locations to bring the home down to certain levels. There are two stairs to enter the home from outside. We have had visitors in wheelchairs but the guest does require assistance for the stairs. The kitchen, dining room and queen bedroom/bathroom are all on one level once in the home. There are two stairs to go down into the Mandala (living) room. Two person Finnish sauna! Reaches 180 F degrees. The pool is heated to approximately 74 - 80 F degrees from May 1st to October 1st. Depending on weather conditions, we may extend the pool heating for a week or so to either side of these dates. Outdoor Jacuzzi style Hot Tub- heated to 104 F degrees all year-round. Additionally, there is a yoga pavilion and yoga mats are provided. There is also a massage table on the premises. You are welcome to invite massage therapists, yoga instructors and other service providers to the premises and we can provide you with recommendations for these services. We also can recommend caterers should you desire it. Wonderful weekend at this gorgeous oasis! We had such a lovely long weekend at Ras Mandal! It’s the most beautiful home! We had a private chef one night that Richard recommended and enjoyed breakfast each morning at the house! Can not recommend this home more! All brand new temp control etc. We had such a wonderful time at Richard's house. It fit 10 adults and 3 babies easily with the cabin, and each room was spacious. The kitchen has everything you need to cook—then sit out around the pool and take in the stunning views. It's beautifully and thoughtfully decorated down to the every inch and unlike any other home I've ever stayed in. The amenities go on for days: hot tub, plunge pool, sauna, yoga pavilion, swing set, walking trails, etc. My only advice is to remember you're up quite high and to get that sunscreen on fast! Otherwise, stock up on supplies and settle in, you won't want to leave. Rass Mandal was a great place for us to stay and explore the Santa Fe area for a week. Everything was as promised in the listing and we had a wonderful time. Rass Mandal is beautiful in every detail. An absolutely magic place to stay! Exceptional! Richard is a wonderful and generous host. The rooms and details are beautiful. The hot tub and sauna perfect. The detailed hiking maps and fire places. The entire stay was exceptional. We only wish we could have stayed longer. For girls weekend, we wanted a unique and one of a kind house for 11 girls. Rass Mandal exceeded our expectations and was absolutely perfect for our group. The views from the property are breathtaking and the house is in great shape. The hosts were very kind and easy to work with and made our stay special. I highly recommend Rass Mandal when visiting Santa Fe. The most magical house you'll ever stay in! There is nothing in the world like Rass Mandal. Everything is provided for you and the house could not be more beautiful and unique. Gorgeous, well-stocked kitchen, comfortable bedrooms, and the most incredible outdoor space to enjoy all year round! Richard is a caring and attentive host and we felt so well taken care of during our weekend stay. He always responded immediately to any questions or requests. No complaints... other than I wish I could have stayed longer!!! Thank you Richard for creating such a magical environment for the world to enjoy! Right from the front door of Rass Mandal, you can either hike or mountain bike the Ponderosa Ridge to Hidden Valley Road down to Wilderness Gate Road and right into town via Canyon Road or the Old Santa Fe Trail. There are so many choices to enjoy - renewing both the body and spirit! Additionally, if lucky on the walk, you may spot coyotes, mule deer and a variety of birds and birds of prey. A 7.5% discount has been applied to the daily rate for stays of 7 nights or more! Additionally, there is a $50/night fee per extra person for parties of more than 10 and up to 12 people. With this extra fee comes the use of a small cabin located adjacent (150 feet) to the main residence. Check in time is generally 4 PM and check out time is generally 10 AM. Pets are not permitted given the nature of the home and our intention to maintain an environment that considers the potential allergies of future guests. Cancellation Policy: Should you cancel 60 days or more before commencement of the rental, your deposit will be returned in full. Should you cancel 59 days or less prior to commencement of the rental, you lose your deposit. We will endeavor to rent the property for your cancelled dates and should we be successful we will return a further portion of your deposit as applicable. Should you believe you may need to cancel, you should consider taking cancellation insurance available from VRBO/HomeAway.